While you will definitely be looking forward to beginning a new life in a new city, the mechanics of moving from Port Macquarie to Sunshine Coast can be extremely tiresome if you attempt to do it all by yourself. The exercise of packing, transporting and unpacking calls for an expertise of a different kind and therefore, is best left to reliable furniture removals, like us! Roadways Furniture Removalists is one of the premier furniture removals companies in Australia; we have built a reputation for matchless service quality over the years that our countless clients will be happy to vouch for. While we will be happy to help you out with local removals, our strength is in long distance and interstate removals; we have got virtually every destination on the map covered and run regular services between the more popular cities. Roadways offers a comprehensive range of Port Macquarie to Sunshine Coast removalists services. We are known for our transparency of the scope of job, and pricing, so that you are never in the dark. Should you require any special services, we will be delighted to generate a customized estimate after a quick evaluation. Backloading: The size of our organization and the frequency of trips between popular destinations allow us to offer you the advantage of backloading, whereby, if you have the need to transport a smaller load, you can share space with other clients of on the same truck. This saves you the cost of having to hire a full truck. Pre-packing: Roadways has a team of expert packers under the command of professional supervisors that will smoothly and efficiently pack your effects, in such a way that they suffer no transportation and handling damage. The packers come equipped with materials like double wall corrugated moving boxes, bubble wrap and a full range of padding materials that ensure the safety of goods. All articles are packed into standard-size rigid cartons or undergo customized pre-packing if so warranted by the nature, shape or dimensions of the article. Transport: Roadways has a full network of interstate furniture removals throughout Australia to take your personal effects to any destination in Australia. Roadways offers a comprehensive range of Port Macquarie to Sunshine Coast Removals Service. We are known for our transparency of the scope of job, and pricing, so that you are never in the dark. Should you require any special services, we will be delighted to generate a customized estimate after a quick evaluation. 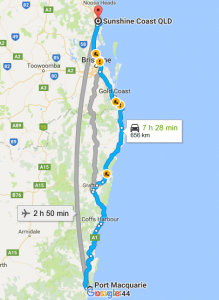 If you need reliable Port Macquarie to Sunshine Coast removalists, Roadways Removals is ready to get the whole process on the way today!